The Shur-Loc is one of the most recognizable hooks in the rigging world. It is a self-closing hook with a heavy-duty latch that engages as soon as a load is applied to the hook for maximum safety. All models are now equipped with a recessed trigger that is flush with the hook body, which protects the trigger from potential damage. The trigger is also easy to operate with enlarged thumb access--important for cold climates where users might be wearing gloves. Crosby S-4316 Latch Kits are readily available when replacement is needed. The swivel eye on top makes this hook suitable for use with wire rope, soft rope or synthetic rigging slings (just be sure to match proper Working Load Limits with all materials involved). It is also designed to fully rotate while under load due to an anti-friction bearing swivel design. Made from Grade 100 alloy steel, featuring Crosby's "Platinum" coloring. 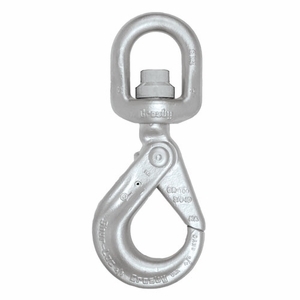 Suitable for use with Grade 100 and Grade 80 alloy chain slings. Safety factor of 4:1.